Perfumer Lyn Harris, formerly of Miller Harris, has introduced Perfumer H, a new niche brand. In addition to bespoke work, Perfumer H plans to release new collections twice a year. The initial group includes five fragrances: Cologne, Rose, Velvet, Leather and Heliotrope. Cologne ~ citrus; with vetiver and asparagus. Rose ~ floral; with rose, carrot seed and sweet musk. Velvet ~ woody chypre; with oak moss, patchouli and frankincense. Leather ~ fougere; with cardamom seed, oak moss and lavender. Heliotrope ~ with orange blossom, vanilla and sweet musk. 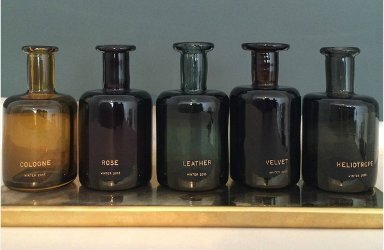 Perfumer H Cologne, Rose, Velvet, Leather and Heliotrope are available at the brand shop on Crawford Street in London. The bottles are hand blown, and they do look lovely. WWD says “Prices range from 175 pounds, or $273 at current exchange, to 1,500 pounds, or $2,344, for the complete formula” but I have no idea about sizes or what they mean by “the complete formula” — all 5 scents, maybe? oof. Maybe “complete formula” refers to the bespoke work? No, doesn’t seem to be, they list other prices for those. Yes, the bottles are lovely. Or maybe EDT vs extrait concentrations, or something? Those prices have put me way off – maybe one of the decanters will carry some of them…. Ah yes, the lotto list. Exactly – what would I really do if I won the lottery? LOL! From the sound of it, she’s looking to keep the brand very small, more so than Miller Harris. So she may feel she doesn’t need to “economize”. Unfortunately, as soon as I read the notes in Cologne, I immediately thought of asparagus pee. The bottle color may be appropriate! In an attempt to redeem myself, I will say that the bottles are gorgeous. Me too, thought they are totally nuts to include aspargus and loved the bottles. Yes, immediately traumatized by the thought of asparagus pee. I love asparagus but can hardly bear to eat them anymore for dread of the aftermath. You mean there’s actually a benefit to my rather blunted sense of smell? Miller Harris was her father’s middle and last names. huh, so is Miller Harris going to continue, I wonder? Oh yes. They got bought by an investment co in 2012. Actually thought they’d have wider distribution by now. These sound interesting. I’m glad I finally got MH Fleurs de Sel, which was a London (or UK?) exclusive. Definitely worth it. Sounds like it will be even more torturous to sample these. These all sound very interesting! meredifay and I are almost scent twins so I am not surprised to be drawn to Velvet and Heliotrope. Might swing past the new shop when I’m in London in December. Not sure any of the fragrances actually appeal, though & the price is ridiculous.